Jack Burbank (born Konrad Burbach) was a professional boxer in the Portland, Oregon area. Jack was born in Norka, Russia in 1905 and immigrated to the United States with his parents. The family first went briefly to Nebraska and was sponsored by an uncle and fellow Norkan, Henry Schwindt. Konrad's father (also Konrad Burbach born in Norka in 1877) worked for the railroad and the family soon moved to Hillrose, Colorado were Konrad was confirmed in 1921 at the Emanuel Congregational Church. Later, the family moved to Portland, Oregon where some of the descendants live today (2015). 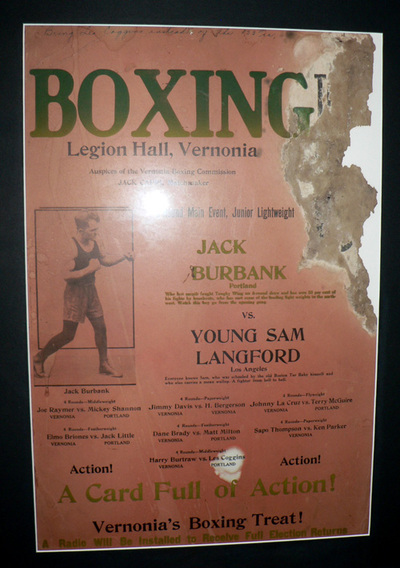 Grandfather knocked out the welter weight champion of the world twice with the same punch, both were non-title fights. His manager handled two wrestlers and they flipped a coin to see who would win. The fight game was corrupt. I think my grandma made him quit. My name is Connie Roger Burbank Jr. It should be Conrad Burbach the second, but let me explain. My father was Connie Roger Burbank Sr., my grandfather was Conrad Burbach born 1905 in Norka, Russia. His father was Conrad Burbach born 1877 in Norka, Russia. They came to America from Liverpool, England in 1906, when my grandfather was not yet one year old. It was an adventure in itself just to get to Liverpool from Norka, but that's another story. They arrived at the port of Philadelphia and traveled to Nebraska where an uncle by the name of Henry Schwindt lived. Uncle Henry had paid their passage. Henry was the husband of Elizabeth Burbach Schwindt, she was the sister to Conrad Burbach's 1877 father, Jacob Burbach, born 1858 in Norka. After arriving in Nebraska, the Burbach family did not stay. After a few months they were off to Colorado. Most of the Burbachs stayed in Colorado, but not my grandfather. He grew to be a strong young man working on the farm in Hillrose, but he never wanted to be a farmer. He was ready for a new life. In his 20's, he headed for Portland, Oregon where he married Bernice Winnie McCutchen in 1926. He became a boxer and his career was promising when he became a local favorite. 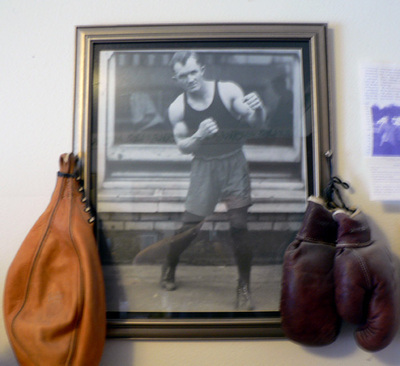 My grandmother was no fan of his boxing career, but was proud of his boxing skills. Training was most important to him, my father told a story about him strapping a small refrigiator to his back and walking up and down the basement stairs to build strength. He had a great right handed upper cut that served him well. As his twenties faded into the thirties, he gave up the gloves and boxing shorts for a suit, and became the business agent for the Portland Cooperage. There he helped settle several strikes. 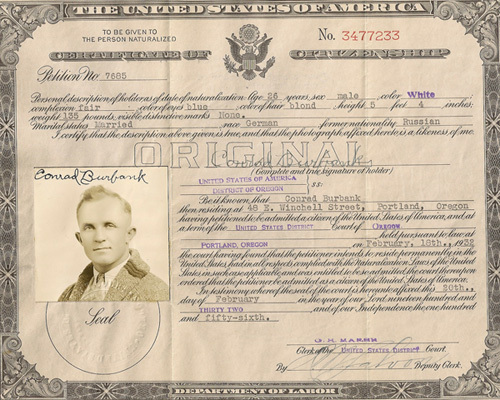 My grandfather wanted to be an American in all areas of his life, though he spoke German at family gatherings, he changed his name to Burbank. While my father was born Conrad, it quickly became "Connie" on both my dads and then my birth certificates. Now I know that Connie is the nick name for Conrad and it is pronounced Coonie rather then the female name sound of Connie. But try explaining that to your friends! My grandfather thought it sounded more American and still kept some German heritage. Grandfather took the civil service exam and became a Postal employee, eventually working his way up to being appointed Postmaster of the old Stock Yard Post Office by President Dwight D. Eisenhowar. The old Stock Yard Post Office on Marine Drive was a business hub in the 1950s and was also part of the area destroyed in the Vanport Flood. He was a member of several organizations such as the Masons, the Shriners and National Association of Postmasters. He made frequent trips back to Colorado to visit the now Burbacks, Burbanks and Burbachs. Out of nine brothers and sisters, he is the only one that came up to Portland. However, I just found out that my great great grandfather lived and died in Portland in 1918. It looks like I have more research to do!